Christina Aguilera wants to officially put to rest her long-rumored celeb feud with Britney Spears. During her Wednesday, Sept. 12, 2018, appearance on Jimmy Kimmel Live!, the "Beautiful" singer opened up about her alleged rivalry with her fellow '90s pop princess. "When I was coming up it was very obvious, you know. 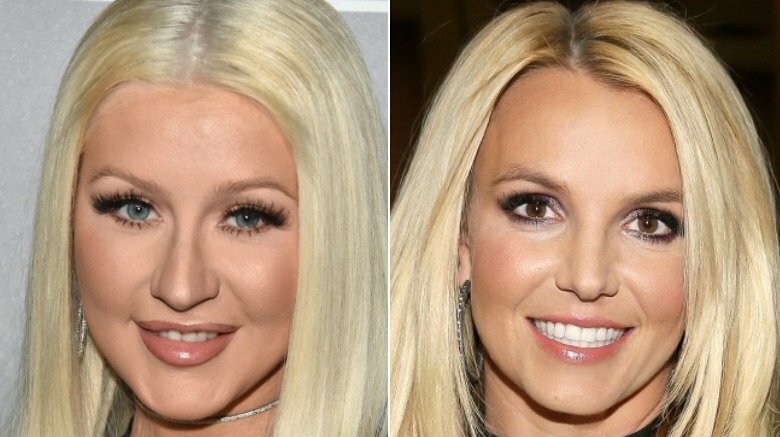 Me and Britney were definitely…there was the Britney/Christina like, you know, considered rivalry thing," Aguilera said, explaining that she and her supposed frenemy were instantly pitted against one another in the press two decades ago. "If we had social media back then, we would have probably done like a song together or something and just like squashed that whole thing." When host Jimmy Kimmel told his guest, "It's probably not too late for that," the "Genie in a Bottle" singer hinted that she might just be willing to make all of our '90s pop dreams come true. "It's probably not too late, Britney," Aguilera playfully said of a possible duet with the "Baby One More Time" hitmaker. "Hey, I'm down," she continued with a laugh after the late-night host said the former Disney stars should do a song together. The "Accelerate" singer went on, "If her reps say OK, you know." While the ongoing feud between rappers Nicki Minaj and Cardi B continues to heat up following an alleged altercation at a New York Fashion Week party last Friday, Sept. 8, it seems like Aguilera is all about squashing old beefs in her own personal life these days. Although she did admit to Kimmel, "I wish I would have seen this juiciness go down! …I'm so that person that's like, 'What's going on? What happened?'" As Nicki Swift previously reported, Pink (real name Alecia Moore) revealed in August 2017 that she and Aguilera, her "Lady Marmalade" collaborator and one-time rival, had "made amends." She went on to tweet at the time, "Music brings us all together. The best part of music is — there's room for everyone to win at the same time." During an appearance on Watch What Happens Live with Andy Cohen shortly after, the "What About Us" singer elaborated on this, telling the titular host, "Women have to learn how to support each other. It's not taught to us on the playground." In her recent interview, Aguilera echoed this sentiment while crediting the power of social media as a platform to do so, telling Kimmel, "I've never seen women and people more…they come together now more."